Aviation is a high-stakes industry, often set in conditions of intense pressure demanding a small margin of error. It is, after all, no easy feat to transport hundreds of people in a way that is both efficient and safe through the skies. And it takes much effort to ensure it, be it through advanced designs, better aircraft materials, or enhanced safety precautions. It is then an industry that is always on the lookout for the next innovation to better its operations and services. Fuel efficiency, in particular, has long been a target goal for many airlines, as fuel serves as the biggest operating expense when it comes to owning an aircraft. Aside from this, there has also been an increasing need to reduce greenhouse emissions, with more efforts to regulate them emerging in light of current developments in climate change. It is called the STARC-ABL, short for Single-aisle Turboelectric Aircraft with an Aft Boundary-Layer propulsor. The new design looks to average a half-mile per gallon in fuel consumption, cutting it down from the usual one mile per 5 gallons. Its most significant innovation is the boundary-layer ingesting (BLI) engine at the back of the plane, which aims to utilize the air moving across the fuselage for added thrust. The BLI engine will be powered using electricity from generators added to the wing-mounted engines, thus decreasing the need for further fuel consumption. The boundary layer has long been a subject of note when it comes to aerodynamics. It occurs near the surface of an object going through a gas or liquid. Molecules closest to the object surface will stick to it, slowing down the rest of the molecules above it due to their collision. And often, the air flow in the boundary layer can come out unpredictable and distorted. That said, the farther away the stream is to the object, the less disturbed the molecules flow. This need for an uninterrupted flow is why planes tend to have their engines under the wings – so they do not come into contact with the slow-moving air. 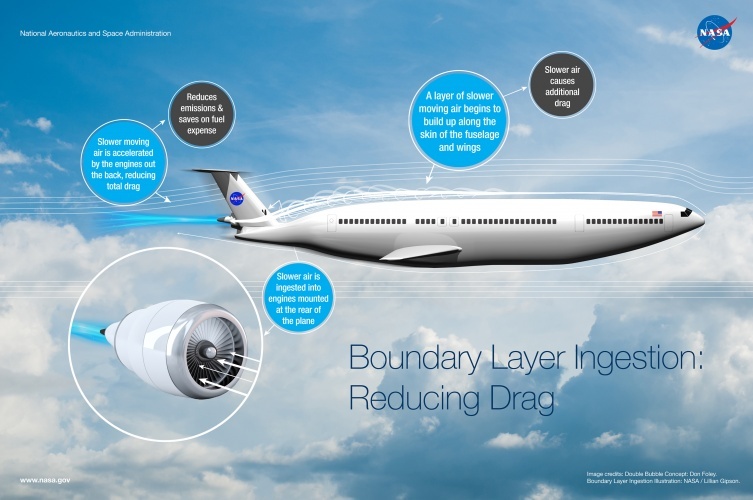 The Glenn Research Center (GRC) at NASA note how understanding the boundary layer can be quite important in solving problems in aerodynamics, such as wing stall and friction drag. For the most part, one had to take it into account when designing for aircraft improvements, as the mechanics of the boundary layer provides a significant amount of drag to the plane. With recent forays into BLI technology, however, a new train of thought has emerged: instead of working around the boundary layer, why not make use of it? The GRC notes that studies have shown the use of such technology can potentially reduce aircraft fuel burn by 8.5%, compared to conventional commercial aircraft. With the BLI engine located at the back of the STARC-ABL’s main fuselage – instead of being mounted onto the sides of the tail, notes NASA – it looks to come into direct contact with the boundary layer air, which it then accelerates upon ingestion. This way, it hopes to reduce the overall drag experienced by the plane. How does the design cut fuel consumption? Usually, traditional jet engines take in the air, compress it, then mix it with fuel for ignition. The blast and exhaust gases are what give the jets the thrust to propel the plane forward. Under extreme conditions, however, aircraft can be put into circumstances of additional drag, which may require more fuel burn for extra thrust. 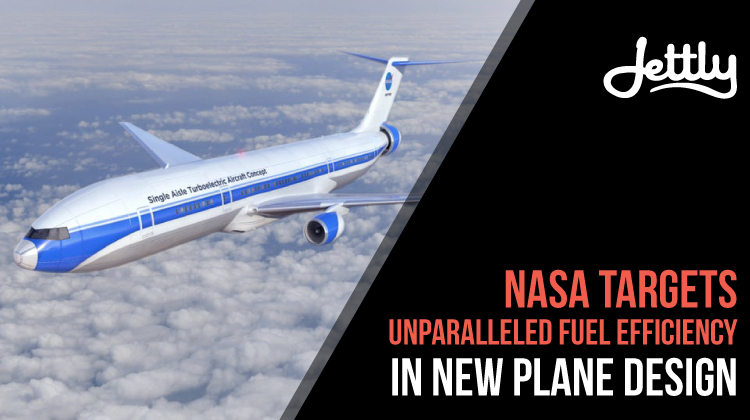 By reducing the overall drag with the STARC-ABL design, then, NASA looks to reduce the thrust needed to push the airplane, while lessening the need for bigger under-wing engines. Both outcomes cut down on the need for further fuel consumption, even under extremely stressful circumstances. And because the BLI engine gets its energy from the electricity generated by the generators attached to the wing turbofans, additional fuel allocation won’t be required for the design. What’s next for the design? Currently, testing for BLI propulsor designs is underway, although it’s admittedly an uphill battle. Distortion from boundary layer winds, after all, can be hard to account for – the BLI engine must be strong enough to handle the stress brought about by it. And while NASA notes that having the placement is possible, it might require a less aerodynamic design. Nonetheless, we’re looking forward to seeing how the final design will look like in the near future. After all, with air passengers looking to double in 2036 and the rising fuel costs that may occur over the years, it’s something we need more than ever. At Jettly, we’re quite passionate about anything aviation as much as we are about bringing you the best air travel experience possible. Contact us to learn more about the STARC-ABL, or perhaps submit a flight request with us for your next trip.